Phillips began the brief with a lament over corruption in politics in general: “Oh, as if we don’t have enough public corruption within our politics to report, we’ve got another piece of news that [is] just developing right now.” She then reported that the Baltimore mayor had been “indicted on public corruption...12 counts, I’m told -- perjury, theft, misconduct in office.” After describing some of the circumstances into the multi-year investigation, she continued her lament by focusing on the prestige of Dixon: “It’s a shame -- Mrs. Dixon was the first woman to serve as the city’s mayor -- also the -- you know, the first African-American female to serve as that city’s mayor.” The mayor’s Democratic affiliation was neither mentioned by Phillips during her brief, nor by CNN’s on-screen graphics. Dixon was charged with perjury, theft, fraudulent misappropriation and misconduct, stemming in part from gifts she received from former boyfriend and developer Ronald H. Lipscomb, who was also charged earlier this week. KYRA PHILLIPS: Oh, as if we don’t have enough public corruption within our politics to report, we’ve got another piece of news that [is] just developing right now. 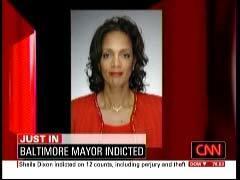 This out of Baltimore -- the Baltimore mayor indicted on public corruption. It happened today -- 12 counts, I’m told -- perjury, theft, misconduct in office. What had happened back in 2008 -- we had reported a two-year state investigation that had been going on into her spending practices there in Baltimore, and then a raid had happened in her home. We’re talking about Mayor Sheila Dixon, and apparently it was one of the most aggressive moves when that investigation was taking place. That’s when we knew something was about to happen, and it was going to get much bigger than folks had expected. They had taken just boxes and boxes of papers out of her home. It’s a shame -- Mrs. Dixon was the first woman to serve as the city’s mayor -- also the -- you know, the first African-American female to serve as that city’s mayor. And now, today she was indicted on perjury, theft, and misconduct in office.